Excellent resource for Laser Disc arcade games! One of my favorite TV hangouts! If you like the Beatles and animation, check out the official web page! Want to put a frog in a blender? How about a gerbil in a microwave? All that and more at Joe Cartoon! Some really funny stuff here! Check out this site! It's bloody funny! Howard Stern? No! These guys are actually funny! 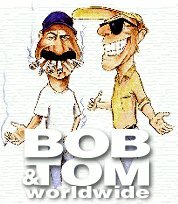 Official website of the Bob and Tom radio show! This is an extremely funny comic strip! Excellent art as well. Looking for a DJ service? Here's a place to check out!